The publication of Ghost Hand as been successfully funded on Kickstarter. Thank you so much for your support. Thank you for backing the project 112%. It was an amazing experience for me to see the money rolling in from family, friends, fans, and even people I didn’t know. Over the course of the project, not only did you fund the money I needed to make Ghost Hand a real book, many of you offered to donate your skills and talents as well. I now have someone copy editing Ghost Hand for free, someone preparing the the print lay-out for free and someone converted all the e-book files for free. These are all tasks I was originally going to have to pay for, which means even more of my Kickstarter funds can go toward promotion and print production of Ghost Hand, as well as research for book two. And yes, that means I will be able to afford that trip to Indianapolis for setting research, even though we didn’t make that final stretch goal. A special thank you goes out to those who have offered to help make Ghost Hand a reality in such a hands-on way. First, it takes about two weeks for the Kickstarter pledges to be processed and finalized to my account, so I won’t see the funds until early September. While I’m waiting, I will be going over Ghost Hand one last time, polishing it to a gleaming shine before sending it out for a professional edit. A professional edit can take up to four weeks, so that puts us into early October before I get it back to make corrections and changes to the manuscript. Meanwhile, I will be ordering ISBNs for the print and e-book versions, and the good news is they come in batches of 10 for $250, which means I will have covered my ISBN needs for four future books as well. Once the edit is done and changes have been made, Ghost Hand will be formatted for e-book and paperback and will go to print. This will take about two weeks, which puts us to mid-October. I will also be making plans for a special Ghost Hand Launch in November, just in time to buy it for the holidays for all your YA-loving kin. Thank you for making the reality of Ghost Hand possible. At the recent GeekGirlCon in Seattle, I attended a panel on Kickstarter. The panelists were Tristan J. Tarwater and Caytlin Vilbrant. Tristan has done several Kickstarters for her fantasy novel series, and Caytlin is a comic artist who has also done multiple Kickstarters. The first thing the panelists discussed was the difference between Indiegogo and Kickstarter. While Indiegogo is open to international projects, for Kickstarter you must be located in the US to run a project. Internationals can back a KS project, they just can’t create one. Indiegogo also does not use the “all of nothing” backing method that Kickstarter does. With Indiegogo, you get whatever funds you raise regardless of your initial goal. Indiegogo allows charity or “fund your life” projects, whereas Kickstarter only allows projects that result in a creative outcome or product. However, Indiegogo does take a larger cut of the funds raised (7% plus 3-5% Amazon charges) whereas Kickstarter only charges 5% plus the 3-5% Amazon charges. In the end, both panelists chose Kickstarter based on its lower fees and its popularity as it is currently the number one crowdfunding website in the world with approximately 6 million hits a day. Less cost and more exposure is hard to argue with. In order to run a successful Kickstarter project, it is crucial to have an existing audience or clientele for your creative project. Unless you are already a well-known artist, your first project will primarily be backed by friends, family, and people who are already aware of your art. It is a good idea to sit down BEFORE you create your project and make a list of your potential backers. Include family, friends, co-workers, acquaintances, Facebook friends, and anyone who has shown a previous interest in your work. This list will guide you as you promote your project before and once it starts. Be aware that only about 10-20% of those on your list will actually fund you. With Kickstarter, setting a realistic funding goal is important because if you don’t make your goal, you don’t get anything. It is better to set a lower goal and overfund, than a higher goal and get nothing. However, it is best to look at your project and estimate the costs involved to make it. Don’t forget to calculate in the fees mentioned above, production and shipping of any rewards, and taxes on your Kickstarter income. Suggestions the panelists offered about creating your project. 1) Make sure you have a video. 2) Break up your text with visuals. Include mock-ups of the product and rewards, art work, and heading borders. 3) Don’t have too many reward tiers, but make sure you hit the most popular level- $25, and have a variety, including $5 for those who just want to test the KS waters. 4) Involve other creative friends and artists in your project. This gives you more options for rewards, broadens your backer base, and helps support your fellow artists by including their work and links to it. 5) It is good to create a short press release with a blurb and visuals and send it out to appropriate blogs, websites and media outlets before you start your project. 6) Be sure to use the update feature to keep the project current and your backers excited. In many cases, Kickstarter projects overfund, meaning they meet their goal and then go beyond it. This is both a blessing and a curse. It is good, because it means you have more money to make your project better. It is a curse because it puts pressure on you to offer bigger and better stretch goal and rewards. The more backers give, the more you can produce, but creating extra rewards takes time and effort and may delay your original delivery estimate. Be careful when choosing stretch rewards. Both Tristan and Caytlin suggested making your stretch rewards digital (perhaps an e-version or an mp3) so they are much easier to produce and cost no extra shipping. One thing the panelists talked about briefly is the fact that Kickstarter processes all its pledges through Amazon, and only Amazon. Your pledge is linked to your Amazon account (or one you create, if you don’t have one yet), and a hold is put on your credit card, but you are not actually charged until the project makes its goal. If it doesn’t make it, you are never charged. During my Kickstarter project some people have asked about this and wondered why Kickstarter doesn’t use PayPal or other forms of payment. The reason Kickstarter doesn’t use PayPal is because PayPal requires the delivery of goods within 30 days or the purchaser can demand a full refund. Obviously, this doesn’t work for a Kickstarter where the project often is not finished in 30 days, and one would not suddenly want to see one’s funding pulled from the project 30 days into the process. As the creator, after your Kickstarter ends you will be exhausted. Running a KS project is similar to running a marathon, and after you cross the finish line you may wonder what possessed you to do it in the first place. And you may be sure you will never do it again. The good news is, just like marathon running, there is something addictive about Kickstarter. You will probably find yourself, sometime in the future, contemplating running another project. And then the question arises,”Are your backers weary?” Have they been tapped out or have you burst the giving bubble. The answer might surprise you. Caytlin Vilbrandt actually pollled her previous backers to see if they were tired of her asking for money through Kickstarter, or if they would rather she fund her project some other way. They almost unanimously responded, “Do another Kickstarter.” You see, Kickstarter is not just addictive to those who create projects. It is also addictive to those who back them. Another surprising statistic that both Caytlin and Tristan shared was that on their first KS, their backers were primarily people they knew or who already knew them. The figure they gave was over 50%. But on their second and subsequent projects, the people they knew comprised only about 5% of their backing. The rest came from people they didn’t know. This shows that Kickstarter is a viable promotional tool. It actively broadens your fan base and artistic audience. It also shows that backer fatigue may exist, but it doesn’t really matter. Your second and third project are going to tap into a new demographic of people who haven’t backed you yet. And it also shows that the more you utilize KS, the better you get at it, and the more credibility you build in the KS community. People can see that you’ve had a previous project succeed and you delivered the goods. Thank you to Tristan and Caytlin for sharing your KS wisdom, and for letting me hand out my Ghost Hand Kickstarter cards. Like this article? Show your support by backing my Ghost Hand Kickstarter project HERE, and help send an Indie to Indy. Want to know more? Check out my Ghost Hand Kickstarter Project HERE. Today, as I was walking to the grocery store, I noticed a hospital bracelet much like the one in the picture above tossed onto the sidewalk. I sidestepped it and kept going, but I couldn’t stop the flood of questions that bracelet evoked. “Whose bracelet was it? Why had they been in the hospital? Why had they yanked it off and tossed it outside of a grocery store?” I found myself in the store, but I wasn’t shopping for food anymore. I was shopping for story. I was looking for the meaning of that bracelet, and I wanted to go back outside, and pluck it up, and read the name on it. And then suddenly I had a small epiphany (or as my husband calls it, “a bit of crazy”). I knew that If I did go out and find that bracelet again, the name on it would undoubtedly be Olivia Black. You see, Olivia Black is the main character of my YA novel Ghost Hand, and in the book Olivia does end up in the hospital. She hates hospitals (much like me), and she really hates doctors, so her hospital stay is fairly short, but the thing that I realized while standing in the produce aisle thinking about that bracelet was that I had completely forgotten to give Olivia one. In the book she doesn’t have a hospital bracelet on, and THAT is a problem. Now, a forgotten bracelet might not seem like much to fuss about, but it is. It is these minute details- the squeak of the nurse’s thick-soled white shoes, the smell of the disinfected hallways, and the crunch of the bracelet against her wrist- that makes Olivia come alive. The Devil is in the detail. Olivia is a fuller, more real character with that bracelet on than she is without it. With that bracelet on, I can feel Olivia wanting it off. I can imagine her trying to squeeze her wrist out of it, or briefly think about gnawing off her own hand, which she decides not to do, of course, because that would definitely require further hospitalization. I can see her walking down my street after her hospital release. I can feel the moment she realizes she still has the “mark of the hospital” on her body. I can see her tugging at her wrist. I can hear the snap of the bracelet when it breaks and she yanks it off, tossing it to the ground. I can feel her step lighten as she walks away free and unencumbered. And I can see myself coming along only a moment later, just missing a glimpse of Olivia, the girl of my imagination, as she steps around the corner of the grocery store and out of sight. Now, I’m off to go give Olivia a hospital bracelet. Want to help me make her come alive for everyone? Be sure to check out my Ghost Hand Kickstarter Project and back it, or go HERE to read the first two chapters of Ghost Hand. 50% of the backers were veterans (have backed other projects), and 50% were newbs (Welcome sweet newbs!). 40% of the backers were from New Zealand (my recent home) and 60% were from the US (my current home). The average pledge amount for the first day was $23.00, and the most common pledge amount was $10. And people have been hugely generous, not only with their pledges, but with their willingness to boost the signal through promoting the project via social networking. Then I hit the second day (today) and I got one pledge. Of course, I am thankful for that one pledge. It put me over the 10% mark for my goal, which puts me at having a 75% chance of success. But wow, it felt like a downer after the activity of yesterday. I have read that a Kickstarter gets the most activity in the first five days, and the last five days, so I’m hoping tomorrow will pick up again. Anyone who backs me in that time frame (by July 25th) will be in a draw to win a signed copy of A Foreign Country, an anthology of New Zealand Speculative Fiction, with my contest-winning story, The Future of the Sky, in it. Plus 21 other amazing short stories by NZ authors including, Juliet Marillier and Paul Haines. Anyway, thanks to all. And if you haven’t jumped on board with Ghost Hand, what are you waiting for? Spread the Word. Back It. Share It. Love it. Many of you have been enjoying my crowdfunding and Kickstarter series of posts. Well, it was all leading up to this day when I put my money where my mouth is (and hopefully you do too:) and try the whole thing out for myself. Yes, I have just launched a Kickstarter Project to fund the publication of my YA novel Ghost Hand. If you aren’t familiar, Kickstarter is a crowdfunding site that uses the power of the internet and word-of-mouth to provide backing for creative projects. Payments are made securely through Amazon, so if you’ve ever bought something from them, you are already set to back me. Haven’t seen me for a while (or ever? ), be sure to check out the project video featuring ME. I’m an introvert, so this is sort of like catching a glimpse of the nocturnal and ever elusive Kiwi. Throughout the thirty day project I will be running special give-aways for those who back me in addition to the rewards listed on the site. Anyone who backs me today, my first day out of the chute, will be entered in a draw to win a signed copy of Andromeda SpaceWays Inflight Magazine #42, featuring my YA fantasy novella, Over the Rim (as well as eleven other great stories). The beautiful and surreal cover of the magazine was designed to illustrate my story. Please go check out my project, back me, and spread the word to friends and family through e-mail and social media, or by clicking the share buttons at the bottom of this page. Great news! 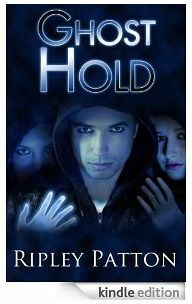 I’ve just made the first two chapters of my YA paranormal novel Ghost Hand available for free on my website HERE. Be sure to let me know what you think of the read. Want to become a Ghost Hand fan and get updates on its progress toward publication? Simply send your request to ghosthandupdates@gmail.com and I’ll send you two more chapters of Ghost Hand for free. Your e-mail address will only be used for Ghost Hand updates like sneak peaks at the new cover, contests, and publication news. Well my dears, Ghosthand is finished. I’ve just completed the big edit after the beta reader round and I’m feeling good. Thus, today begins a new era. The age of the agent. I have just sent off a nice query letter to my agency of first choice and we shall see what they think. Here is the final synopsis/teaser blurb I settled on for the book. Seventeen-year-old Olivia Black was born with a ghosthand, and it just went rogue. It wants to reach into people and pull things out. Things from the darkest depths of the human psyche never meant to exist in this world. Olivia can’t control it, but Marcus can. He’s the new guy at her small Midwestern high school: a handsome, cocky, stranger who has the ability to keep her hand in check with only his touch. Marcus claims that Olivia is in grave danger—that her name is on a list of teenagers with ghostlimbs who have begun mysteriously disappearing one by one. Marcus says he can help her. All she has to do is leave everyone and everything she’s ever known and he promises to keep her safe. Or maybe he’s just one more person desperate for the power of Olivia’s hand.